MICRO Vortex Generator Kit for the Beechcraft Baron 55 is FAA STC approved and ready for installation on your airplane. 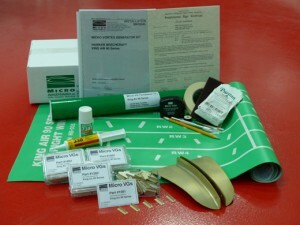 The Micro VG Kit includes the STC, VGs, installation tools, computer cut templates, detailed illustrated drawings and instructions, and Loctite® 330™ Depend® Adhesive for installing the vortex generators on your airplane. VGs mounted on both sides of the rudder! Strakes on both engine nacelles! Micro VG Kit consists of 106 vortex generators mounted on the wings, just aft of the boot line and on both sides of the rudder, plus two strakes on the outside of the engine nacelles.